Successfully Added Zidoo X5 Android TV Box - 4K x 2K, H.265, Android 5.1, Penta Core Amlogic S905 CPU, Kodi, Airplay, DLNA, Miracast to your Shopping Cart. The ZIDOO X5 is a true 4K media player powered by the impressive Amlogic S905 Quad Core 64 bit ARM Cortex A53 CPU. This penta-core processor runs at 2GHz and is accompanied by a Mali-450 GPU and 1GB of RAM, which allows the player to easily support 4K for some fantastic TV viewing. It's not just films that will work great as this 64 Bit processor is suitable for running a wide range of Android games bringing you hours of entertainment. With H.265 video decoding supported you can enjoy the same quality as H.264 but at twice the bandwidth so when connected to your internet the ZIDOO X5 is able to stream high quality movies right to your TV. 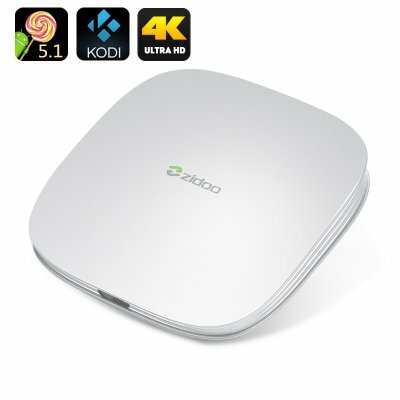 The Android 5.1 TV box has some nice ZIDOO customizations making navigation even easier and with Kodi preinstalled there is an almost unlimited range of content as you can access hundreds of channels for live sports, movies, music and TV shows without having to pay hefty monthly subscription fees. With Airplay, DLNA and Miracast you can connect your Smartphone directly to the TV box and share content on the big screen easily. great for games and movies, there are also plenty of ports so you can connect USB devices and external storage as well as hook the media player to your speakers and add up to 32GB of extra storage via the micro SD card slot. The ZIDOO X5 Android TV Box comes with a 12 months warranty, brought to you by the leader in electronic devices as well as wholesale mini PC and TV Boxes.. Received the Zidoo X5. Very good delivery and quality! !